It’s no secret that we here at iSlaytheDragon are big fans of Dominion and its many expansions. I think we may have logged more plays of that game alone than all our other games combined, especially if you count online play. So when Dark Ages, the seventh expansion and fifth big-box expansion was announced, we were excited and yet filled with reservations. With hundreds of cards already in the mix, what new could Dark Ages bring that wouldn’t toss the game over the edge of the cliffs of insanity? Would this be the expansion that finally jumped the Dominion shark? Find out below as both @Futurewolfie and @FarmerLenny share their thoughts on the latest, biggest Dominion expansion. If you haven’t played Dominion before, you should start there. 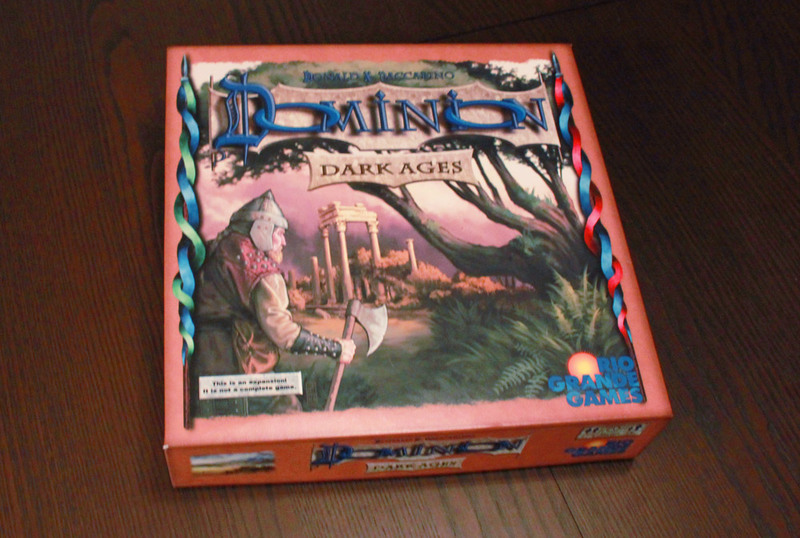 Not much we say here will make a lot of sense to you; and if you’re new to Dominion, you shouldn’t start with Dark Ages, which builds on concepts introduced in six previous expansions, in addition to the original game itself. Our review of that can be found here. If you have played Dominion, you’ll understand the basic structure of the game, which Dark Ages leaves unchanged. But the box is filled with 500 cards that add new concepts to the way cards are played and what happens to them afterward. The main theme of this expansion–the Dark Ages–ties in to the major new concept, which is cards that interact heavily with the trash pile. While previously cards that entered the trash stayed in the trash, there are now ways to get stuff out of the trash. In addition, many cards have an effect that resolves when they are trashed. The first specific change is a new set of starting cards. Instead of the three starting estates, players receive three Shelters, which are not worth points, but instead have some functionality. They’re still pretty worthless, but in some cases can be useful. Each player starts with the same three cards. Ruins are a cost-0 card type that are to action cards what curses are to VPs. A few other cards that aren’t in the supply–Spoils, Madman, and Mercenaries–are gained through playing other cards in specific ways, rather than paying treasure. One of my favorite aspects of Dominion is the trashing. I love culling my deck, replacing bad cards with good ones, and then good ones with great ones. I like Upgrading, Chapeling, Stewarding, and all manner of sending unwanted cards to the heaping garbage pile. And Dark Ages takes that to a whole new level. There are so many cards that do interesting and exciting things with trashing. The predominant “when you trash this” ability is drawing cards, but that mixes in with cards that trash in unique ways, cards that trash other people’s cards, and defenses against those attacks. The nice thing about “when you trash” is that it happens when you trash, which can be on another player’s turn. Cards like the Grave Robber add a clever cycling element to the trashing system. It allows you to trash cards; but it also allows the option of retrieving trashed cards instead. Pair that with a nice card that does something useful when trashed, and you can get some fun combos going on. The Shelters are a blast; the differences are subtle but the prospects are exciting. Sure, the cards are mostly useless, and they can certainly have a negative effect on cards like Baron (from Intrigue) early in the game. But they can be useful, and I can’t tell you how many times that +2 actions on the Necropolis has started a powerful chain of actions when no other +2 action cards were available. The ruins are also a fun addition, although they bring the pain. They are technically “action” cards though, which frees up a lot of activity; many cards that allow you to trash action cards only can help you get rid of the things. And sometimes the +1 buy or +1 treasure you get tips your hand over the edge. The cards-that-turn-into-other-cards are fun too. It’s interesting to add new ways to obtain cards into the game, and it makes me wonder if we’ll see more of that in the upcoming (and final) expansion, Guilds; with only two sets it feels like there’s a lot left to be explored in that area. Still, they are fun to play, and the second step of each card is pretty powerful. And there’s even a bit of thematic interest there–the Hermit likes to be alone, but if he stays away from the village for too long (i.e., if you don’t buy anything on your turn), he goes crazy and becomes the Madman. Nice. There are plenty of new attack cards as well that give players ruins or force them to trash; and while there aren’t any specific defensive cards added, since many of the cards give you a benefit when they are trashed, and many cards can be used to trash those nasty ruins for a great benefit (like the Death Cart, which is +5 Treasure but you must trash an action card, which includes ruins, or the Death Cart itself is trashed). Dark Ages can be pretty intense played by itself. It doesn’t include the base cards, so at the very least you’ll need to mix the base cards from the main set or Intrigue, but I would recommend balancing it out with other sets. It mixes extremely well with Intrigue, and I’ve had some great games with fantastic combinations. I’m sure you’ll be able to figure out some of your own. I like how each Dominion expansion has added new concepts incrementally, built off the concepts added in the previous expansions, and teased new concepts that show up more completely in future sets. And yet, they all manage to contain the simple structure and consistent keywords of the original game. Once you’re experienced at Dominion, there is very little to learn for each new set: a few minor clarifications, but it generally takes a glance over a card to grasp what it does. While some cards have unexpected results and require trying out to see how they really work, this is all part of the fun of Dominion. And Dark Ages is no exception. Without changing the rules, Dark Ages brings the focus to the trash pile, plopping it down front and center and giving you so many new ways to get cards, mess with other players’ decks, and build the most expansive dominion, even if it is one built on top of a trash heap. It’s hard for me to put the expansions in order of preference, and that order can change pretty easily, but Dark Ages might be one of my favorite expansions. It was definitely worth the addition to my collection. It makes Dominion bigger and even more exciting. It may not be as necessary as Intrigue is, but I love it. I like Dominion quite a bit, and Dark Ages certainly brings more of it (a lot more). Yet while the cards are fun to play with, I’ve decided it’s an expansion I don’t need to own. @Futurewolfie covered what the new cards do pretty well, and they are fun to use, but the main problem I see with Dark Ages is that it develops the game away from its core strengths. Dominion is an excellent game to use to introduce others to the hobby, mainly because it’s quick, simple, and straightforward. Turns have a nice mnemonic to help players remember what to do, the game is easy to set up (once you have a system), and most of the other sets generally give players a sense of accomplishment when building their decks. Granted, there are cursing attacks in the other sets, but generally the junk-giving cards are at a minimum. Quake in fear at the power of the Knights! All these and more, in a single Supply pile. I said earlier that Dark Ages brings more of Dominion, and I mean it. But while it doesn’t change the base rules, it moves the game away from some of these things that make it accessible. For example, many of the cards in Dark Ages have large chunks of text on them, one of the things that earlier sets generally eschew. With Dark Ages’ focus on the trash, there is also more upkeep in the game, especially as there are cards that “monitor” the trash pile. There are more junk attacks that add cards to other players’ decks, and while there are also more cards to get rid of them, this generally increases the game’s length. Still, I like Dark Ages–quite a bit. It’s fun (most of the time) to trash things. Now Dominion feels more like a cube-manipulating Euro. (“This thing becomes that thing which becomes another thing that scores me victory points!”) And I don’t mind the artificial uphill climb that the Dark Ages cards represent. Just don’t ask me to introduce this set to my wife or my family, as I’m pretty sure they’d never play Dominion again. Madman comes from the Hermit, Mercenary from the Urchin. No buying these cards. I almost wish I could buy Dark Ages a la carte, because there are several cards in the set that I love. For example, I love the Spoils cards. Spoils is essentially a gold that is returned after use. The only way to gain it is through another card (like Bandit Camp, Pillage, and Marauder), but Spoils can tip the balance in the game. These cards also present an interesting decision: should I use the Spoils now or save it for a more opportune time? There’s no way to cycle a used Spoils card through your deck. I really like the Shelters cards, which force players to consider what to do with their starting cards. Necropolis is terrible if there are any +2 action cards on the board–but there aren’t always, and then Necropolis invaluable. Hovel is kind of like a choose-your-own-adventure victory card. Typically you want to get rid of estates anyway; Hovel lets you ditch it when you’re ready. Overgrown Estate is worthless, but hey–when you trash it, you get to draw. I also like some of the new trashing cards. Count gives you lots of crazy options–+3 coins, trash your hand, gain a duchy–in exchange for some other crazy options–discard two cards, put a card on top of your deck, gain a copper. I like the Junk Dealer, which is a +1 card/+1 action trasher. And I like some of the trash-for-benefit cards. I especially like the combo of Bishop (from Prosperity)/Fortress. When you trash Fortress, you put it right back in your hand, so it’s a great way to rack up points with the Bishop. Cultist is one of my favorite attacks: it gives each other player a ruins, you get to draw two cards, and then you can play another Cultist from your hand (a boon in games that lack villages). And when you trash a Cultist, you get +3 cards, another benefit. I like Dark Ages–I really do–but as I said, I don’t see much need to own it. While it’s interesting and I like playing it with my gamer friends, it doesn’t have the broad appeal of some earlier sets, and for that reason it’s less essential for me. It changes the game, but it moves it in a direction that my family won’t want to follow. There’s a lot packed into the Dark Ages box, but not a lot I want to bring home. Next Article Point: Is Settlers of Catan a Worker Placement Game?